Yes it is finished. The fabulous custom quilting was done by my friend Leeanne of Quiltmekiwi. She has done a wonderful job, and I hope she had fun creating all the swoops and swirls and feathery flourishes. She also quilted my sister's version and that will be winging it's way to Brisbane this week with our Mum, ready for her to finish. After much deliberation I chose a Brandon Mably print, called Victoria Stripe Hot for the binding. I was besieged by doubt about my fabric choice as I started hand stitching it down, thinking it too bright, but I am happy with it now it is finished. Well the binding has been put on, the hanging rods in place and Solstice Dream has now replaced Bird Dance on the wall in my Family room. I fell in love with this beautiful printed rayon on my first trip to The Fabric Shop in Otara. On my last visit, I finally decided to buy some, not really having a pattern in mind, I figured I could always revert to the tried and tested Bellbird Top, of which I have made a couple. However when I was downloading the Uvita Top pattern from Itch to Stitch, I came across the Carey top pattern and thought that this looked like something I'd wear. It can be made in either a woven or a knit fabric. Itch to Stitch patterns always give very clear detailed instructions, and illustrations which make them it easy to follow. (actually I have found this with a lot of indie patterns, they assume you are not a sewing expert, so explain things really well) .This pattern also gave different options for hemming the shirt, depending on what type of machine you were using. This was the first time I have sewn with rayon, and it has been a bit of a learning curve for me. I have learnt that spray starch and the iron are my friends, as are lots of pins. I over edged all the pattern pieces before I started sewing them. For the contrast panel in the sleeve, I used remnants of chambray voile leftover from my Sorbetto Top. Sewing this top has taken me a little longer than usual, however I figured that slowly working away on this, sewing a couple of seams at a time, carefully pressing after each one, then pinning the next seams well, would give me a top I enjoyed wearing. Making the ties was probably the fiddliest part (the hem was a close second), you can use ready made cording, but I couldn't be bothered driving to Spotlight to find any. I like the look of ties that match the shirt not the contrast panel too. Overall, I am really pleased with how it turned out. It is possibly a little more snug over the hips than I thought it would be, so I may need to try grading my pattern next time. ( I made this in a size 2). Despite knowing that this shirt will need to be ironed everytime I wear it, I know it will be worn a lot over summer. I'm at that point in my year, where I am feeling the itch to start a new quilting project. I've completed three of my wips, and am putting off my others. There is such a lovely sense of anticipation when you decide on a new quilt, then spend hours perusing your stash, making fabric pulls and maybe purchasing a little more to complete it. These are few of the inspiring quilts that have caught my eye lately and are tempting me to start something new. By clicking on the photo captions you will be taken to the maker's blog or Instagram page. This is another one from Jen Kingwell's book Quilt Lovely. Again not one I had looked at and thought 'ooh I must make that'. But when this fresh brighter coloured version popped up in my IG feed, I took another look at the pattern. This would be a great quilt for all those scraps or even my Liberty stash, do I want to do all that applique though. This is another quilt that appeared in my IG feed the other day. Amy actually started this in a workshop with Anna Maria Horner herself (very envious am I, one day AMH will visit New Zealand). Anna Maria Horner's Folk Flower quilt has always appealed to me, however I really love the warm muted autumnal colour palette and the softly faded bohemian feel to Amy's version of it. The flowers are reverse appliqued ( a skill I have yet to learn) but at least it's with a machine. I also love this version from @geegeemaryanne. I have loved this since Linda started making it. 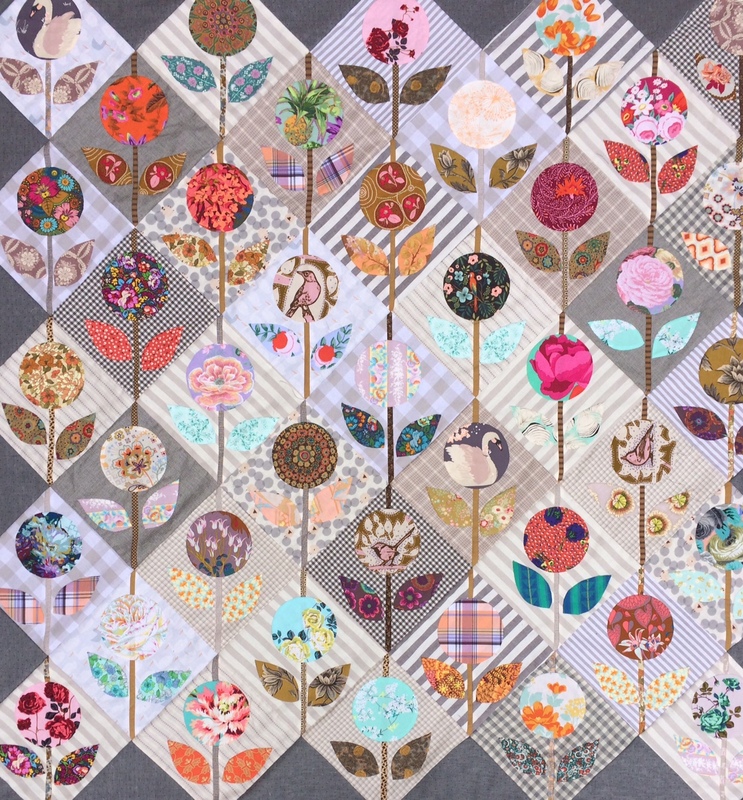 The pattern comes from Judy Newman's Book, Quilts for Life made with Love, such a great way to use large floral prints , and I love the secondary pattern these blocks create. I love the colour in this, the large bold prints and the ombre effect she has created with grey fabrics. Framed by white, this just speaks to me. I'm not sure whether I'd have enough bright fabrics in my stash though. This beautiful bunch of protea buds was given to me a kind neighbour, I'm hoping they'll open up fully to reveal their gorgeous feathery interiors. More good books to read, I have just finished Beach House Renuion and am now reading Beautiful Exiles a novel about war correspondent Martha Gellhorn and Ernest Hemingway. They book club I run at my library, has a curated theme set each fortnight. Last time the theme was Venice, so novels set in Venice, travel memoirs, and Venetian cook books were picked for the group to read. I read this cook book, and decided to bake the Venetian Yellow Polenta Cookies from it. I also found it online too, so if you feel like making them it's here. I've started making the next Christmas decoration for the annual 12 Days of Christmas swap my sister and I do. This is No. 9, the drummer drumming. Pattern from mmmcrafts. Fiddly little bodies to make and I'm not looking forward to giving him a face. Today, the sun is shining and we have a lovely mild spring day, I'm off to spend a little time in the garden, before hopefully doing some sewing later on. Have a wonderful weekend. 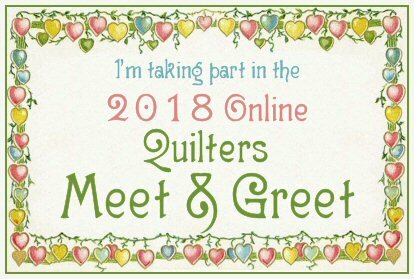 Hello and welcome to the Online Quilter's Meet & Greet hosted by Benita of Victoriana Quilt Designs. For those who haven't visited my blog before, my name is Julie and I have been blogging here at JulieLou since 2013. Originally I started my blog as a way for my mum and sister who don't live near me to see my quilting and other craftwork, both progress and finished projects. I now blog about the things that make me happy: quilting, EPP, embroidery and applique, my garden, cooking, hiking, reading and my latest foray into making clothes. I don't think I have a definitive quilting style. I'm definitely not scared to use colour, and if anything, I seem to have a phobia about using white in my quilts. Low volume is fine, white just doesn't seem to happen. Grey is probably my go to neutral. Scrappy quilts of some description are probably my favourite to make. My favourite fabric designer is Anna Maria Horner - I adore her brightly coloured bohemian styled fabrics. My latest quilt finish and current favourite was made from her fabrics that I had been hoarding in my stash. Liberty fabrics are also a favourite and have been used in lots of little items like pin cushions and needle cases, as well as a quilt. Last year I discovered the joy of wool felt applique and embroidery, Bird Dance was my first project using these materials and I enjoyed it so much I have recently finished Solstice Dream another wool applique hanging. 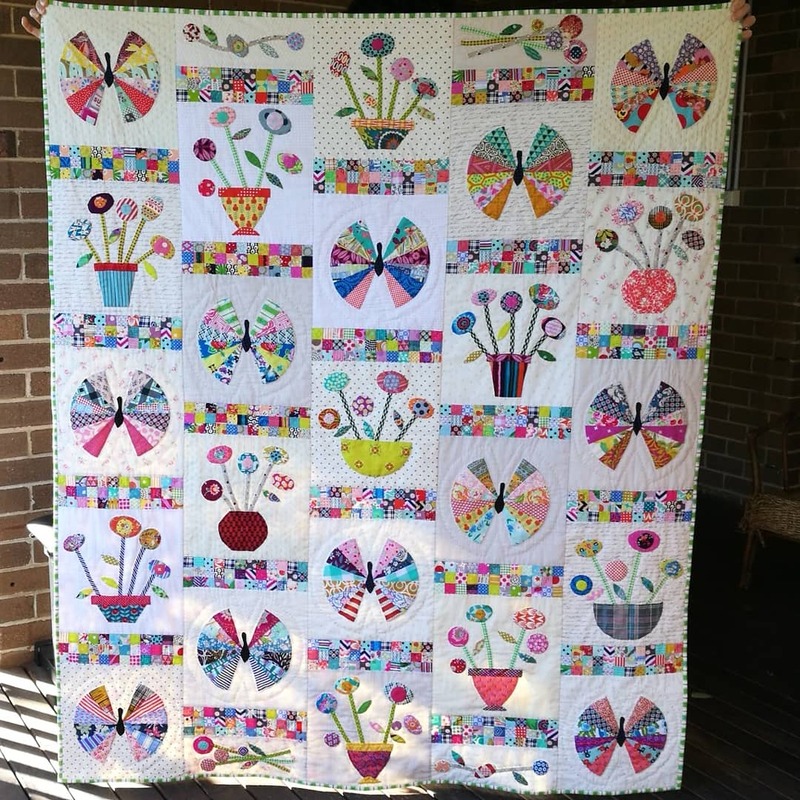 I enjoy EPP too, my WIP (which I haven't touched since January) is my Ice Cream Soda Blossoms quilt, which I am still hoping to turn into a finished quilt this year. I think hexis are my favourite shape to play with though. There are still lots of quilts I'd like to make, and I have lots of fabric to be used, so there will always be something being created with fabric and thread here at JulieLou. 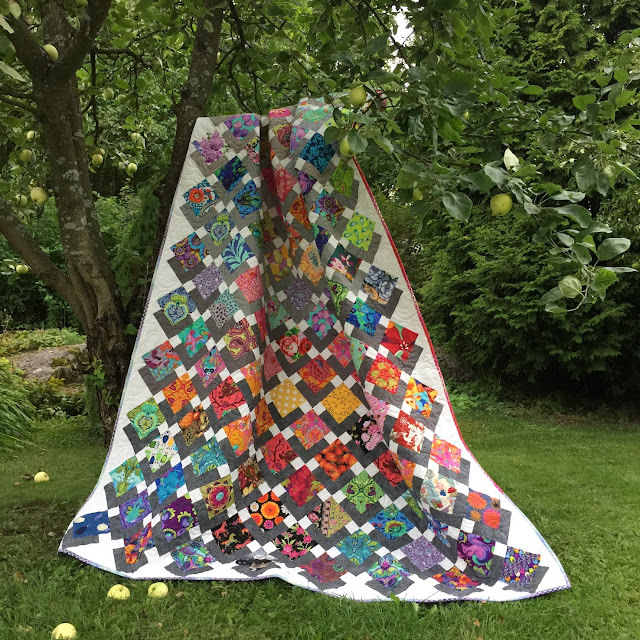 For stories and pictures on all the quilts I've made, check out my Quilt Gallery here. and if you'd like the chance to win some fabulous prizes click the link below this image.